It's fun, colourful, tasty and even chewy! Tired of the latest fad coffees? Something new is hitting tea houses and coffeeshops across USA. It’s bubble tea. 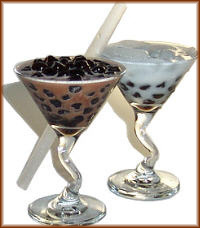 This bizarre drink also goes by the names boba, pearl tea, milk tea, or bubble drink. It’s part drink, part dessert snack, and all fun! Bubble tea is far from the plain-looking tea you are familiar with. It comes in a wild variety of flavours and colours. Challenge your palate with peach, lichee, mango or passionfruit! There is also the more traditional green or black tea flavours. It can be served either hot or cold. But the fun part of bubble tea isn’t the colours or the flavours, it’s the ‘bubbles’. Big, black, balls of chewy tapioca are what make bubble tea such an interesting experience. These pearls are about the size of marbles and they sink to the bottom of your cup. This tea is usually served with a gigantic straw just the right size for slurping up these gummy treats. 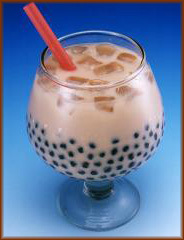 Bubble tea originated overseas in Taiwan and has only recent migrated to North America within the last 10 years or so. You can now find places serving bubble tea in most major cities, such as Los Angeles, Seattle, Vancouver, New York and Toronto. Many say that the local imports just aren’t as good as the stuff you get in Japan and Taiwan. If you enjoy being creative in the kitchen, you can make pearl tea at home, but it’s not easy. The starchy tapioca pearls can be hard to work with. If you boil them too long, they dissolve. Not long enough, and they are hard in the middle.